In this day and age, as the population grows in the places we live, available space becomes more constrained. Increasingly more homes are designed with this in mind. If we aren’t figure out how to work with the space we have, we will likely feel cramped and unsatisfied within our homes, and no one wants that! In reality, most spaces can be made to look more expansive with the right amount of intention and creativity in our décor. There is no need to settle for claustrophobia when there are so many straightforward ways to make rooms appear larger no matter their size. One room in particular that tends to get short changed on size is the dining room. It’s often viewed as an auxiliary room, and many of us only use it on special occasions. It’s not always an easy task to fit everything in, but we are here to help! Here is how to make your small dining room look bigger. 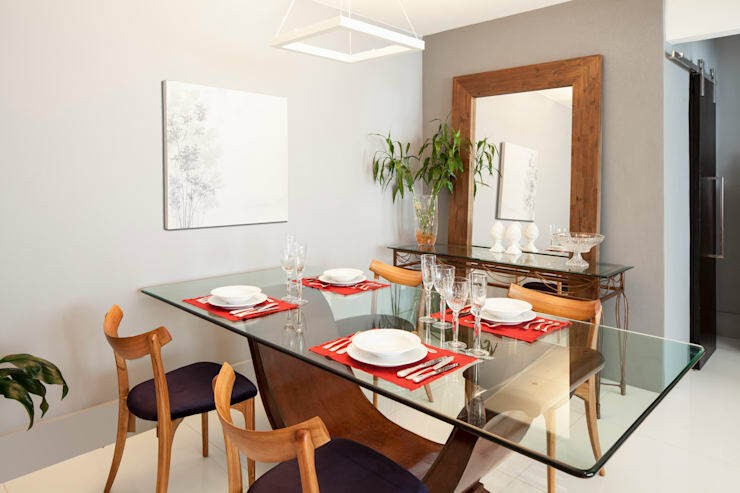 Though traditional dining rooms feature rich colours like deep reds, royal blues, and mahogany toned wood, many more modern and minimalistic styles allow you to play with more unconventional dining room colours. If your dining room is small, consider going with a style such as this. Light colours are associated with spaciousness and going with a lighter colour scheme can certainly help to make the dining room look bigger. In actuality, this dining room is housed in a space that isn’t all that much larger than a corridor. Yet, the room feels bright and roomy because the colour of the wood is light and the walls are white. Combined with some trendy chairs and a wooden bench, the room is stylish and the limited space is optimised. Equally important as using light colours to make the dining room look more expansive is to ensure that your dining room has access to proper lighting. 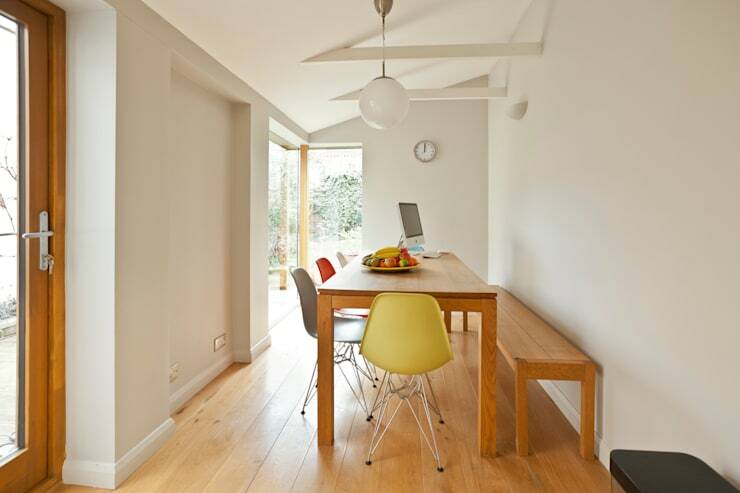 In fact, a light colour scheme will actually be most effective if an abundance of natural light is present. Natural light is also helpful for making the room more generally inviting, which will help to encourage you and your family to get the most out of using the dining space. This wooded dining room looks absolutely lovely with the large windows that expose some greenery and allow for the flow of plenty of light. 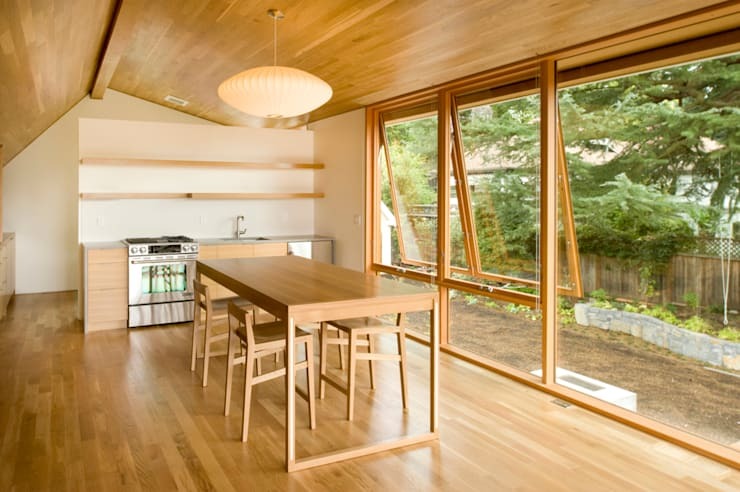 If you don’t happen to have windows like these in your dining room, however, don’t worry. Other ways of allowing the most sunshine to make it into your dining room include opting for sheer curtains rather than darker, opaque ones and painting the windowsills white or a light colour to help better project light into the room. The dining room furniture available on the market may often feel bulky as dining room tables are usually made to accommodate six people… and that means six accompanying chairs have to fit there as well, among other items of furniture and décor. Not to worry! There are some simple tricks to selecting the ideal furniture for your dining room that will fit proportionately inside of it. For starters, go with multifunctional and practical furniture. Choose a dining room table and chair set that could also double as a place for your kids to do their homework or for you to do your own office tasks. This is an easy way to add function and use to the dining room. Another alternative is to choose a round table, as they are generally less bulky. Finally, there are many various foldout options when if comes to selecting the right a dining room table. We love this example as it offers a great example of multi-functionality. You may have noticed that a running theme in this Ideabook about how to make your small dining room look bigger is related to adding light and brightness in your dining room as much as possible. So we’re going to tell you one more thing on the subject, and it that adding mirrors in your dining room will surely work to multiply existing light in the room and create the illusion of space. In fact, people have been using mirrors as a means of making their rooms of their shops and homes look bigger for centuries. The larger the mirror the better, or you can use multiple different mirrors for a decorative touch. To get the best effect, place the mirror in the path of sunlight. The large mirror in this dining room increases the light in the room and reflects the white walls in such a way that it augments their surface area. A second reason why practicing minimalism is effective in making a space appear larger is that it prompts you to be very selective on the decorative objects you include in a given room. The result is that the eye is drawn to what few items you incorporate, but the small room is not overpowered by a large proportion of the space being occupied by so many different pieces. We think this dining room is a perfect display of how using only a few decorative objects can keep the small space balanced, make it look tied together, and still not clutter up the room. 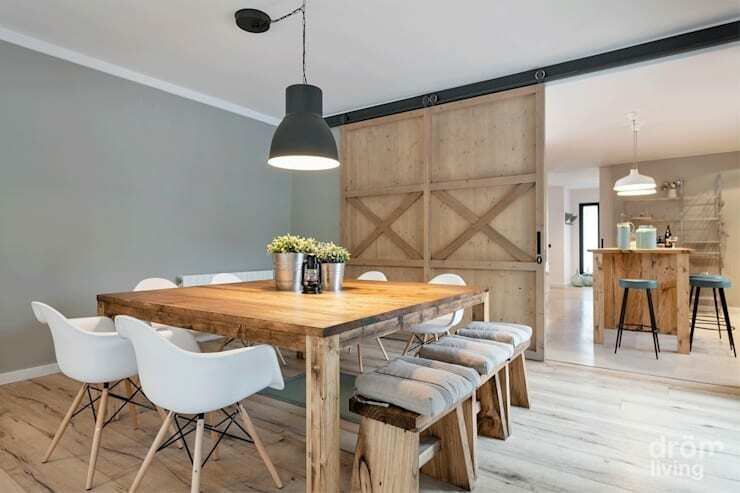 The barn doors are highlighted wonderfully in the room as a functional piece of decoration. 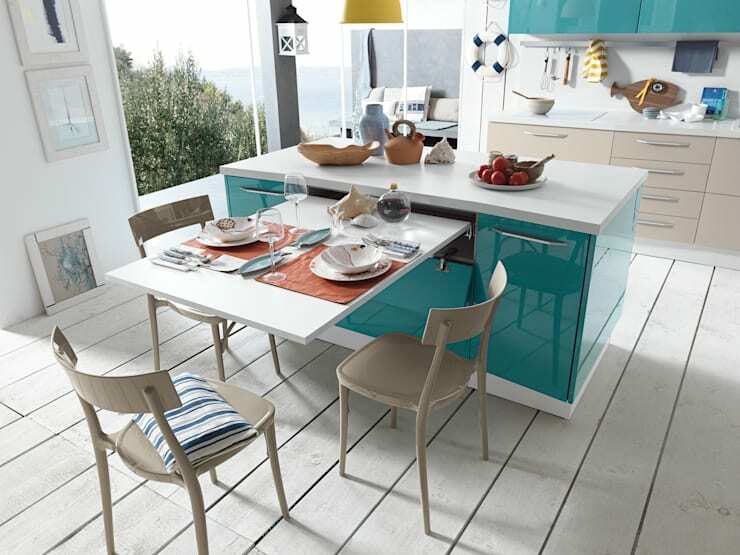 Further, the plans are showcased beautifully on the table, adding just the right pop of colour and vivacity. In fact, plants can be a great decorative instrument for small spaces because they promote peace and wellbeing, which will surely ward off feelings of confined in a small room. If you enjoyed this Ideabook about how to make your small dining room look bigger, you might also be interested in these tips on how to make your small bathroom more spacious. Another bulky item in the typical dining room is the china cabinet and any other furnishings we use to stow glassware and more formal dining accessories. We invite you to embrace your small dining room by experimenting with alternative storage options. There are so many out there to choose from. Our favourite for the dining room is to use the walls in the dining room for storage. Whether or not you have a built in space for shelving, this can be a no brainer for maximising space in a small dinning room. 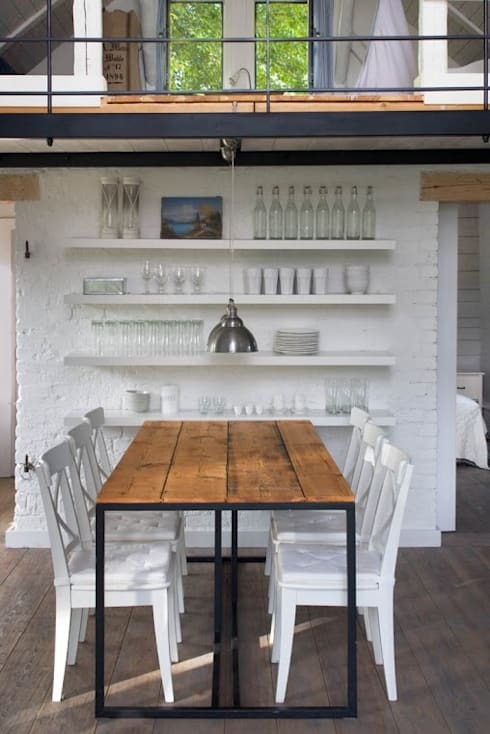 We love this sleek, white-accented rustic dining room by AA S.C. Anatol Kuczyński Anna Kuczyńska for this reason. Using floating shelves will take up the least amount of space and actually allow your glassware to play a second role as dining room décor. The symmetry in this dining room offset nicely by the neatly displayed glassware.